To make long story short – you don’t need the fastest microSD card. You can take any Samsung or SanDisk card and you’ll be fine. Read further for a longer story. There are 3 types of memory you need to know about. MLC, TLC and SLC. Names stand for (Multi / Triple / Single) Level Cell. The main difference between them, as the name suggests, is how many bits are stored per cell. SLC contain just one bit per cell, MLC – two bits, and TLC – three bits. In practice it explains a few things about cards made with these technologies. TLC are also known as “3 bit MLC” or MLC-3, as they came after the MLC and “three” is also “multi” (I.e. many, more than one). There is also MLC-4. In SLC, each cell contains one bit of data. So, for 16Gb of data you need over 137 billion of cells. With MLC – twice less. With TLC – three times less. Less number of cells = smaller size and lower cost. Therefore, SLC is only used in SSD drives, while MLC and TLC – in SD and microSD cards. Reading each bit from separate cell is also a faster process. You can ask 8 cells to give you one bit each, so you would have a byte, and you can do it simultaneously. But if this byte is stored in 4 cells, then you should ask each cell twice. Unless you have really smart controller that would store bits in different cells. So it’s not the rule of the physics and you can have TLC card that has both high speed and capacity, it’s just rare. A good example of high quality TLC cards are Samsung EVO+ and SanDisk Extreme. At this time, the more bits cell stores, the higher is the chance for data to be corrupted and less write cycles per cell are available. Well, that’s the theory. In practice, your card may outlive the device or fail the next day after the purchase. So I wouldn’t really look at write cycles. For example, when used in dashcam (video camera installed at windshield of the car) even the TLC card can work for years, until the dashcam is replaced with superior model. The dashcam is an extreme example, because it writes a lot of data constantly, at the top speed supported by the microSD card, sometimes for hours. And the cell phone is not a dashcam, even when it’s working in 4K camera mode. It uses powerful processor to compress the data before it’s written to the card, and can cache the data in vast memory before it’s flushed to the card. The mobile phone doesn’t need the fast microSD controller, and so it doesn’t have one. While the internal memory of your phone is super fast and reliable SLC, and operating system and most applications are loaded from it, the microSD card is used mainly to store contents. It changed a little in Android 5, when you’ve got the possibility to format your external card as part of internal memory (so you shouldn’t get the “out of free space” message anymore, having sufficiently big microSD card), but even there not all manufacturers followed the lead, and Samsung Galaxy S7, including Edge, can’t format your external card as internal storage, so you can only use it to store content. So, if your external card is only used to store content, for example – recorded video, it’s easy to calculate the writing speed you need to get from microSD card. If your video with highest quality settings takes 1Gb per minute of recording, it makes 1024 / 60 = 17 Mb / second of sequential write. Just about any microSDHC card can do it. For example, the SanDisk Ultra writes at exactly 17.8Mb/s. But if I’ll get the card capable of 90Mb/s writing, it will be even better, right? No. It won’t. The microSD controller of your phone most likely can’t achieve so high speed. Samsung Galaxy S7, for example, can’t write faster than 34Mb/s and read speed is only twice faster – about 74Mb/s. So, if you think that your super-fast PRO card that reads at more than 100Mb/s at your computer could deliver you the same speed at your phone – just forget it, the phone controller isn’t capable to deliver such speed. Some IT specialists may think about using the capacity of their phones as some sort of replacement for the flash drive, but then again – USB3 flash drive may deliver over a 100Mb/s write speed, without the need to wear off the micro-USB port of your phone. It’s also worth mentioning, that smaller cards may be more reliable and faster than larger cards of the same brand and model (e.g. Evo+ 128Gb is slower and less reliable than Evo+ 64Gb), as different technology might be used in cells or controller may be more efficient with smaller size. 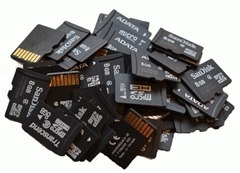 Ask yourself whether you really need these 128 or 200 Gb on your microSD, because if 64 Gb are sufficient, then it’s not only money you save, but perhaps also time and data. You still need the more expensive and faster MLC card in devices that deliver writing at high speed and where resilience is critically important. Dashcam, professional photo or video camera, perhaps ICTV. You absolutely don’t need the PRO card, like Samsung PRO, which is fabulous (read at 91 and write at 80.3 Mb/s), but is an overkill for any modern smartphone as of 2016/2017.